This wild salmon recipe has become one of my weeknight faves. Wild salmon is an ingredient that doesn’t need a lot of “help.” It has rich texture and full flavor, so your best bet is to keep it simple. This super-easy rub calls on smoked paprika to complement the richness of the fish. We love it on tortillas, topped with our Fiery-Sweet Peach Salsa, Quick-Pickled Red Onions and sliced avocado. Preheat grill or a grill pan to medium-high heat. Combine the first 5 ingredients in a small bowl. Rub over skinless side of salmon. 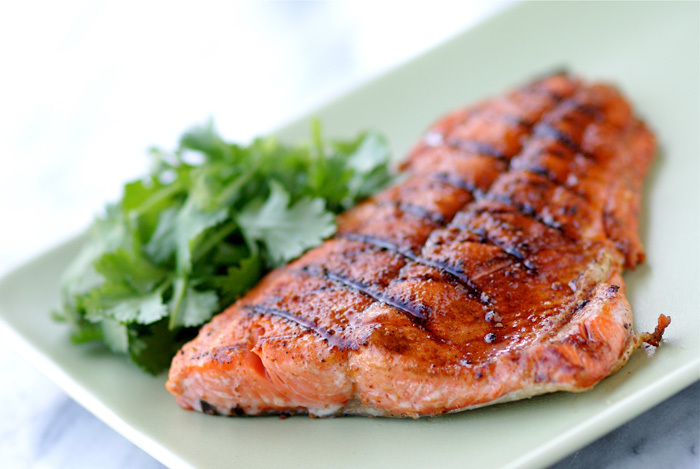 Brush both sides of salmon with oil. Grill 5 minutes on each side, or until desired degree of doneness.